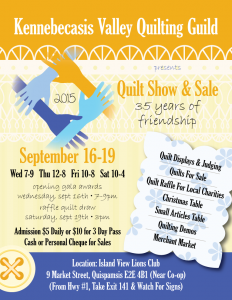 The Kennebacasis Valley Quilting Guild’s (KVQG) 35th Annual Show and Sale happens September 16th to 19th at the Island View Lions Club, 9 Market Street, in Quispamsis. The theme of the Show is “35 years of Friendship”. KVQG members took part in the “Friendship” Challenge this year, where two members of the guild make a different project each — one representing traditional, the other abstract. These will be a featured display. 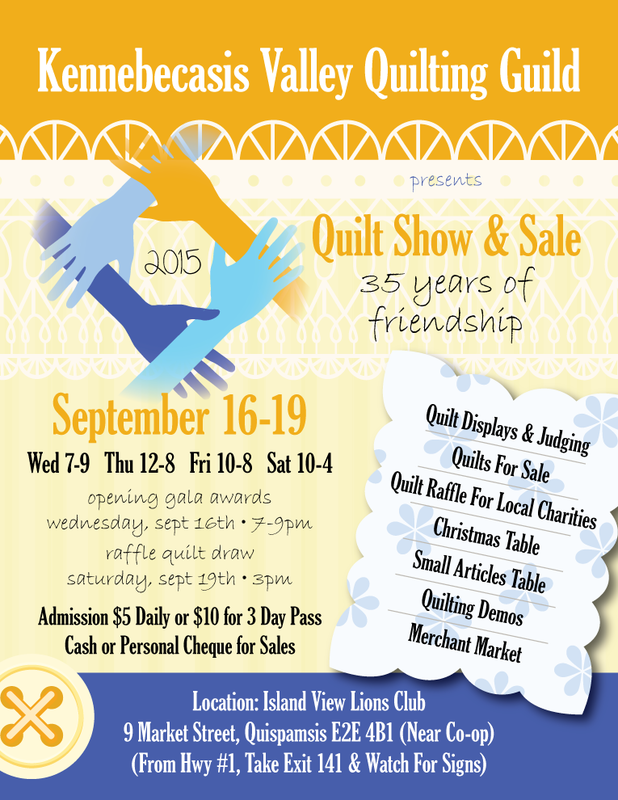 Other features of this year’s show include a judged show, display and sale quilts, Members Craft Boutique, Christmas Corner, Merchants Market and quilting Demonstrations. A Chinese Auction will also be featured again this year with lots of fun baskets. The proceeds from the sale of tickets will go to a charity in the area. The Opening Awards Gala happens Wednesday September 16th from 7 pm to 9 pm. The Show is open on Thursday September 17th from 12 noon to 8 pm; Friday September 18th from 10 am to 8 pm; and Saturday Sept 19th from 10 am to 4 pm. Admission is $5 per day or you can get a three day pass for $10. To get to the Island View Lions Club outside Saint John, on the Sussex side, take Exit 141 off Highway 1 and off Millennium Drive beside the Ken-Val Co-Op, there will be numerous signs to help guide you. Should you have questions or concerns feel free to contact Louise McShane at aurea130@live.ca.